Four women will qualify to the 2020 Olympic Games by winning the overall title of the FIG’s Apparatus World Cup two-year series, which began with Cottbus in 2018 and ends with Doha in 2020. 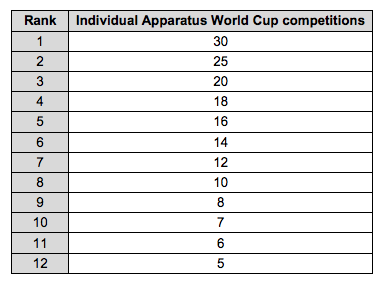 Each gymnast who places in the top 12 at an apparatus world cup receives points that coincide with her ranking. At the conclusion of the eight apparatus world cups, the gymnast with the highest three-meet point total on each apparatus will be declared the apparatus series winner to earn the bid to Tokyo. We’re tracking all of the point totals along the way, which you can find below. Note that we’re tracking only those who are eligible for qualification, which means anyone part of a world championships team that qualified to the Olympic Games in 2018 is not listed here. We also used the FIG’s tie-breaker rules to accurately rank any gymnasts with matching point totals.